So the irony of asking about sickness in the paranormal realm; I was laid low by the flu. See what prompted the question was my husband getting the flu or as he likes to call it the Spanish influenza. He was sick for 2 weeks. I foolishly thought I was in the clear. That was until the kidlet got sick. You know what that means right? The Flu in full effect and it took me four days to recover. It was one of those times that I wished I was a being that didn’t have to deal with sickness. Anywho, we come to the gist of my post. Time Travel. Laying in bed with a sick kidlet curled up at my side and a jealous dog on the other. Our coughs synchronizing. I wished I could go back in time and stop my husband from bringing the plague to my house. Which made me realize that I’d neglected that particular genre. I’m usually up for anything. Hell I like, Shifters, vampires, witches ghost and ghouls. But, one of the genres I don’t find myself drawn to as a Paranormal Romance Reader/ writer is Time Travel. I like Dr. Who. I just don’t go searching for Time Travel romances. I know there are tons of people that love them. People that have no qualms in hunting out the latest and greatest. I however am not one of them. I couldn’t remember the last time I’d come across a time travel romance on my shelves and had to text a friend to see if she’d read any. 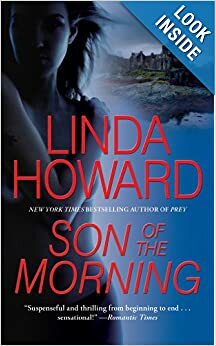 Turns out she too rarely reads them but that we both owned and had read at least one, Linda Howard’s Son of the Morning. Then I decided to go digging on my shelves because where there is one there’s more right? Yup I found another one. Sharon Sala writing as Dinah McCall’s, Dreamcatcher. I know I have others, I just haven’t found them yet. Which all goes to say I’ll read anything as long as it’s a good story. So who out there reads Time Travel stories and what do you recommend? ← What could be better than Defiance? I love time travel BUT, not a huge fan of magical devices, though these were my first introduction to time travel. I like a good old time machine. I wrote a time travel romance and it was very hard, getting all the paradoxes sorted out. Vowed I’d never do it again. And I did it again. LOL Apparently I liked hosing my characters and afflicting myself. Love Dr. Who, as well, but would not like to get stuck in a time without decent plumbing.